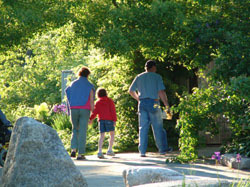 The Gardens are a great place for kids - they enjoy the simple things in nature. But to keep your youngsters engaged, we provide a "bouquet of opportunities". Everyday activities like our Scavenger Hunts give your kids an extra project to do as you enjoy the Gardens, and our organized activities (GPS Quests, Junior Shutterbugs) provide a learning opportunity for kids or families. Check out our Calendar of Events for specific information on upcoming activities. And just for Fun, check out our Kidz Zone with your children .